In the middle of a thunder storm, loud and ugly, this past Saturday I found myself cooking for thirty five persons, all friends of my father’s who was celebrating his birthday. With still more than a week till the beginning of spring, these past three days downright hot like today’s 33ºC (90ºF), the only day it poured buckets, starting at 2am and stopping past 7pm, was the one I had to transport myself quite a few miles north and set up table for many, hoping they would all show up. I always have a what-if-only-a-few came to my party moment? Or worse, nobody? Of course I had help, but food is stressful to serve to many, and what if they don’t like it? All the guests came as planned, rain or no rain, and let me tell you they all ate. The feast was similar to the one two years ago, with a lotta meat and chorizos grilling, simple salads and more sophisticated ones, a nice amount of wine to keep their eyes off the pouring rain and finally trays of sweet squares of three kinds, the hazelnut brownies which I made with almonds and that have become the chocolate fix among my friends – and now among my father’s friends -, the dulce de leche coconut bars because they never fail to have people licking their fingers and finally this passion fruit lemon cheesecake, a no-bake thing I put together two days before because I had made a curd with the leftover yolks from the floating island, and you always need some citrus when feeding a crowd. 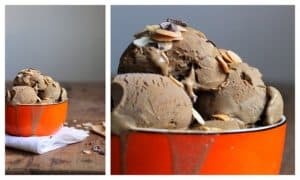 Chocolate and citrus, you can never go wrong with those two flavors. I didn’t think it would be so well received, my dad’s girlfriend calling the next day saying that everyone had raved so much about the cheesecake but she hadn’t been able to taste it, being a hostess and all, not knowing that a few slices had been stashed by me in the freezer and then forgot about it, so they never got served. I could hear her happy dance through the phone when she opened the freezer. 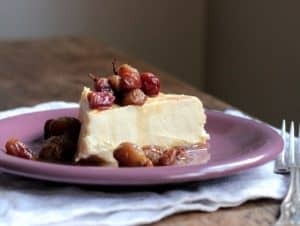 Family squeals aside, I thought this cheesecake needed a few tweaks still, but since a lot of foodies had a very different opinion last Saturday and proclaimed it one of their favorite things I ever made for them – and trust me I have cooked and baked a lot of times for this crowd – I’m sharing it with you today. Just as I made it that day. It needs freezer time, otherwise, it’s too soft to eat without forks, which was exactly my intention that day, because I didn’t want to add any gelatin to it. But if washing forks is your thing, or your dishwasher’s thing, or don’t want to encourage finger licking as a thing, go ahead and serve it on a plate. I would freeze it anyway, and take it out 10 to 15 minutes before serving it. You can also use a round cake mold and serve slices as you would any cake. If you want to add gelatin to it, use 1 teaspoon unflavored powder dissolved in 5 teaspoons cold water. 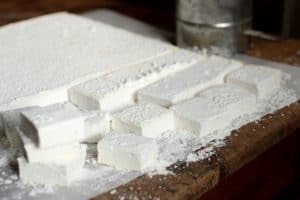 Melt it over a stove, the bowl barely touching the flame, let it cool to lukewarm and add it to the cream cheese mixture before pouring it into the mold. If you’re not used to working with gelatin but want to, here’s a tutorial. About the passion fruit pulp, I simply mash it with a fork as much as I can. It ends with some thicker parts, but I like that. And it’s much simpler. If you want a very smooth pulp, strain it to extract as much juice as you can, separate the seeds, and process the pulp. Add it to the juice with the seeds. I don’t see the point in doing this. In a bowl, whisk together egg yolks and sugar for 1 minute. Add passion fruit pulp and reserve. In a heavy bottomed medium saucepan, melt butter without letting it boil. Add the yolk mixture, and cook over low/medium heat, stirring constantly, until the mixture begins to thicken, about 5 minutes. Don’t let it boil. Transfer to sterilized jars or a container and keep refrigerated. Makes about 2 ½ cups. Prepare a crumb base mixing crumbs with the brown butter until it resembles wet sand. Line a 9×13-inch (23x33cm) pan with 2 inch sides with aluminum foil, letting it hang over the two long sides (the short sides won’t have foil). Pat the crumb mixture evenly over bottom. Refrigerate while making filling. In a large bowl, beat cream cheese until smooth. Add cream and beat for 2 or 3 minutes, until beginning to thicken. Add condensed milk, lemon zest and mix well. Pour over prepared base. 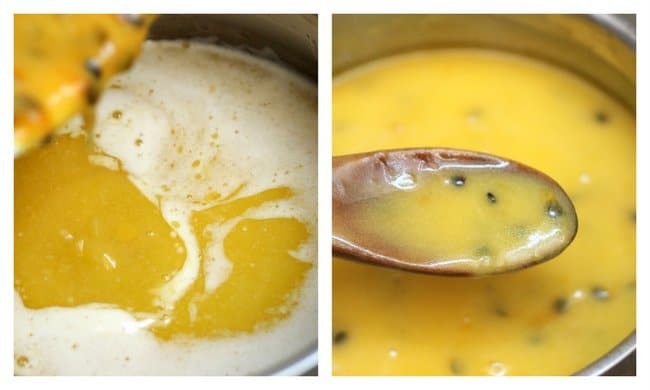 Add dollops of passionfruit curd all over the batter, and with a knife, swirl it lightly. Refrigerate for 2 hours and then freeze until ready to serve. Take out of the freeze about 15 mintues before serving. Cut into squares and serve. I just discovered passion fruit this summer and I can't believe how beautiful the flavor is. I bought a bunch of them and was at a loss for how to use them, wish I'd seen this! 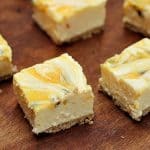 Oh my- I love passion fruit and this cheesecake looks like such a scrumptious way to use it! I so wish I could get my hands on some passionfruit! I would definitely make this gorgeous cheesecake! These bites sound heavenly with the brown butter crust! 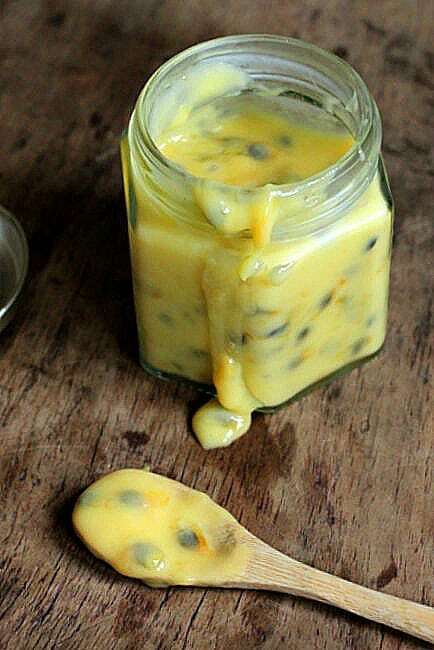 I adore passion fruit and your curd looks perfectly mouth-watering! I was hoping to get some passion fruit from my in-law's garden. Too bad, somehow there was 0 fruit on the tree this year. 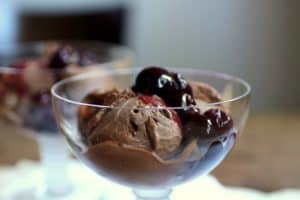 🙁 I guess I'll have to head to the market and get some to make this. Looks scrumptious. I never saw where they grow. I would be very happy to have them in my backyard! This sounds & looks amazing! I want a spoon and that jar! Wow, that looks insanely good! 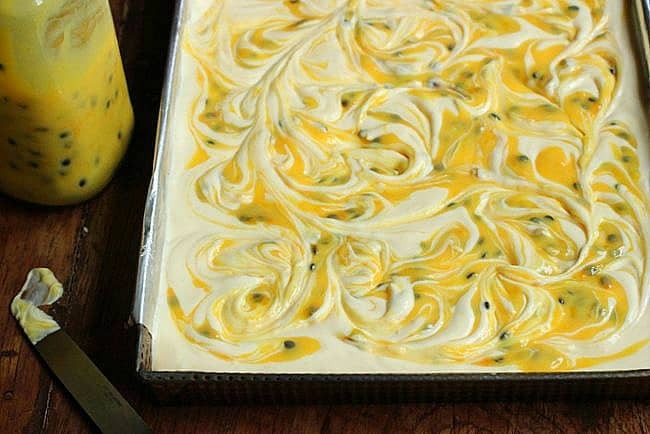 I love passion fruit and it's even better that it's no-bake. Yay! 🙂 Thanks for the recipe Paula! Paula, I can just see the spread of food that you prepared – I am sure that all guests and your dad were seriously impressed and happy and then this lovely looking dessert…it sounds wonderfully tart and juut perfect after a wonderful meal and for a birthday celebration – I would do a little dance myself for these (and I am by no means talented in any shape or form in the dance department) – have a blissful Thursday, Paula! I am fascinated by the passion fruit curd and think it is gorgeous! I'm not usually a cheesecake fan, but the lemony fruit curd would definitely have me grabbing a piece. And what a nice change from brownies when one wants an easy-to-make bar! 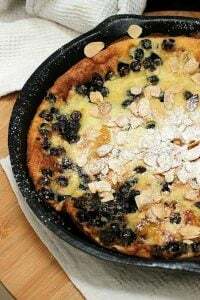 Browned butter crust – oh yea!! And what a cheesecake too. I can see why everyone was so happy to get this sweet treat. I am not surprised this cheesecake was success, it looks so good! And passion fruit curd sounds so interesting and delicious! I bet you created quite a feast for your dad (happy birthday to him again!). 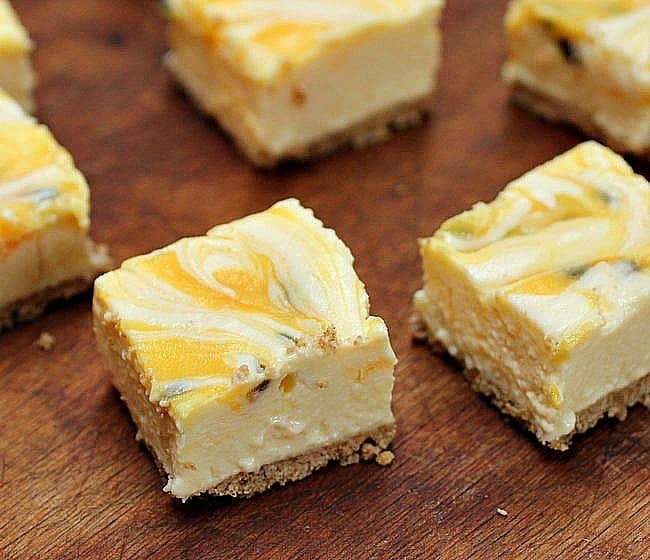 These cheesecake looks fantastic-I want to dip a spoon into that jar of passionfruit curd. The party sounds fabulous. . and aren't you the BEST for cooking and baking all of this food? . . and for saving some of the cheesecake for your father's girlfriend?! I bet she loves you now 🙂 and dude, I love Nigella. . the passion fruit curd sounds amazing! yummm! I really love the tropical aroma of passionfruit. 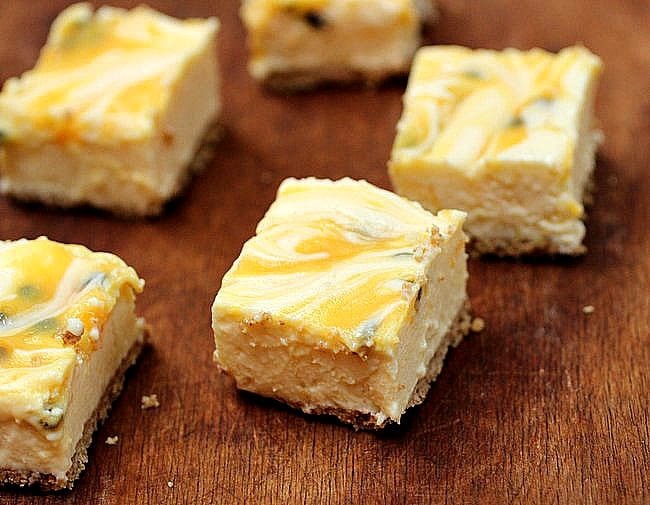 These cheesecake bars look fantastic. I can see why they were the hit of the party. I imagine it would be a lot of fun to be at your parties. Thanks, Paula. Hola Paula: Menudo trabajo que has tenido, pero valió la pena. Tiene una pinta fabulosa, voy a preparar muy pronto. Saludos. Gracias Celeste! Si la hacés espero que te guste! What a sweet daughter you are. I could totally relate to doing a happy dance at hearing of unexpected treats in my freezer. 🙂 Honestly, I have a weird aversion to the little seed in passion fruit – they kind of freak me out. HOWEVER, these look so good that I must get past my neurosis. 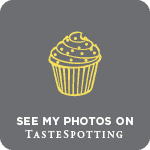 Your swirl on top is amazing – I'm jealous of your swirling skills! I bet this cheesecake smells so wonderful!